Our Biscuit Packing Machine (Mini Pack) is the best machine for packing biscuits piled in small numbers like 2, 3 or 4. Our Biscuit Packing Machine (Mini Pack) offers high speed in packing the biscuits because it has double sealing jaws. 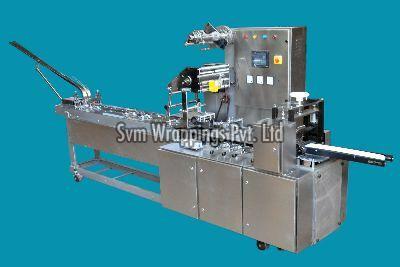 With our Biscuit Packing Machine (Mini Pack) the high speed of 200pkt/minute can be achieved. Our Biscuit Packing Machine (Mini Pack) remains in use for years with low maintenance needs. Capacity Production for Every 8 Hrs. Maximum width of the product 60mm. Minimum width of the product 25mm. Maximum width of the packing material 250 mm. Minimum width of the packing material 90 mm..